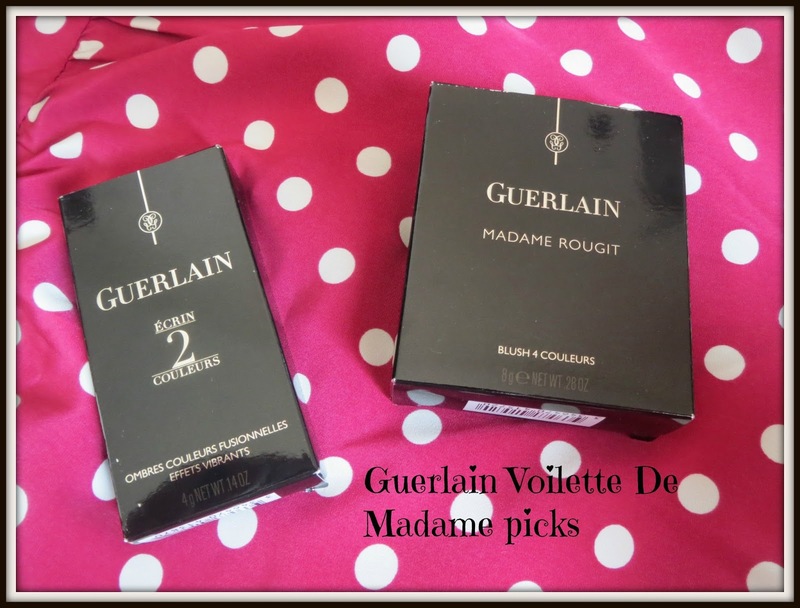 I am a big fan of Guerlain cosmetics-unfortunately they are super expensive but they are oh so luxe. Their newest collection 'Voilette de Madame' does not disappoint in the luxe stakes and I knew as soon as I saw it I would snap up the limited edition blusher. After I read Sara from Colour Me Loud's post on the eyeshadow duo's I was smitten! The packaging is sleek and shiny! The eyeshadow comes cased in a gold compact embossed with Guerlain with a long mirror inside. The blusher is packaged in a glossy black shell. Seriously sleek on the outside, seriously beautiful on the inside. The blusher is the key piece of the collection and it's absolutely stunning to look at. The compact houses a raspberry pink, coral, peach and neutral pink. The 4 shades can be swirled together to create a unique combination of colour or you can use your brush in a more concentrated way on each of the 4 colours. The silver overspray disappears after a couple of uses but the embossed circle pattern remains. The blush is fairly sheer which for me makes it perfect for day wear, but the formula is long lasting. I love the way you can vary the colours by sweeping your brush across different parts of the palette making it a really versatile product-it works well on my pale skin tone but I do wonder if darker skintones would see the same colour payoff. The cooler tones are towards the bottom of the palette and the warmer tones at the top. It also has a matte finish. 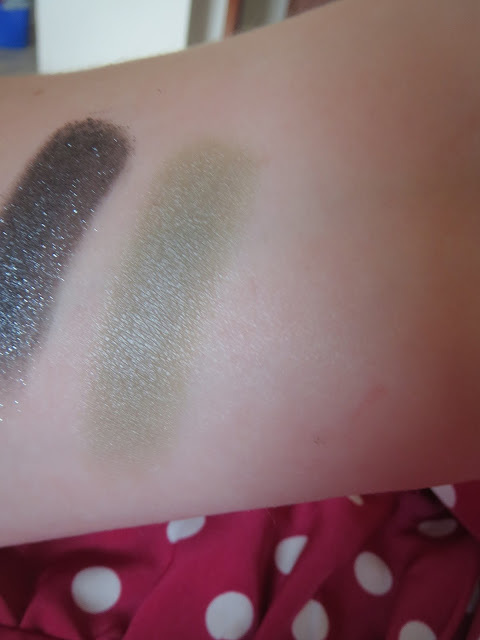 The Ecrin 2 Couleurs Eyeshadow duo comes in 8 fairly unusual colour combinations and me being a sucker for green I chose 'Two rock' which is a combination of sage green and a glittery black. The sage colour is a matte formula with a satin finish; swatched it looks a little flat and unimpressive in my opinion but on the eye it really brings out the colour of my green eyes. The black is a glitter and looks like it has a gritty texture in the palette but is actually as smooth as silk to apply. When I received these in the post (I bought mine from Selfridges online) I was dying to play with them so one morning as soon as I woke up I started to apply the shadow to a naked face and without an eyeshadow primer. Seriously within 1 minute I had created the best smokey eye I have ever done-the colours were so easy to blend and really flattering. 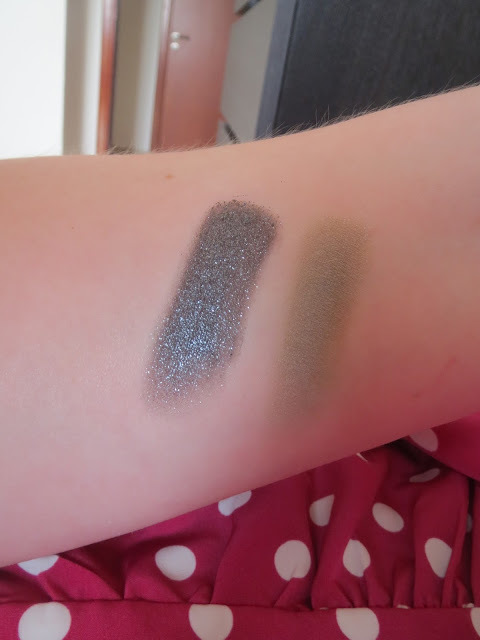 The black doesnt look harsh at all and could easily be blended out BUT it is very glittery and has a fair bit of fallout so I would recommend doing your eyes first before the rest of your make up so that you can clean up any glitter spilling all round your face! Overall I am not disappointed with either purchase and feel like I don't have anything similar in my collection. Totally ready for their Christmas collection now! Has anything caught your eye from this collection? That blusher looks stunning!! I want, I want!!! !